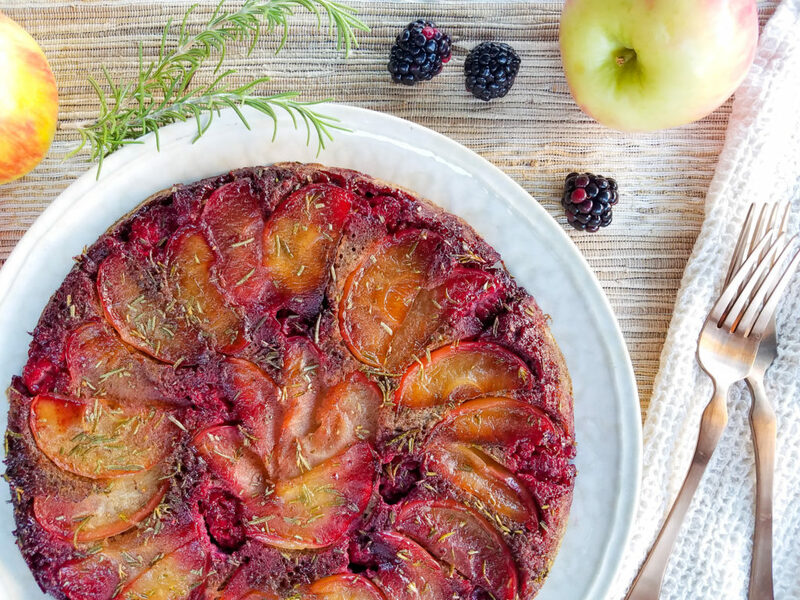 Apples and blackberries are nestled in a bath of butter, coconut sugar and rosemary before being enrobed in a cloak of pancake batter. 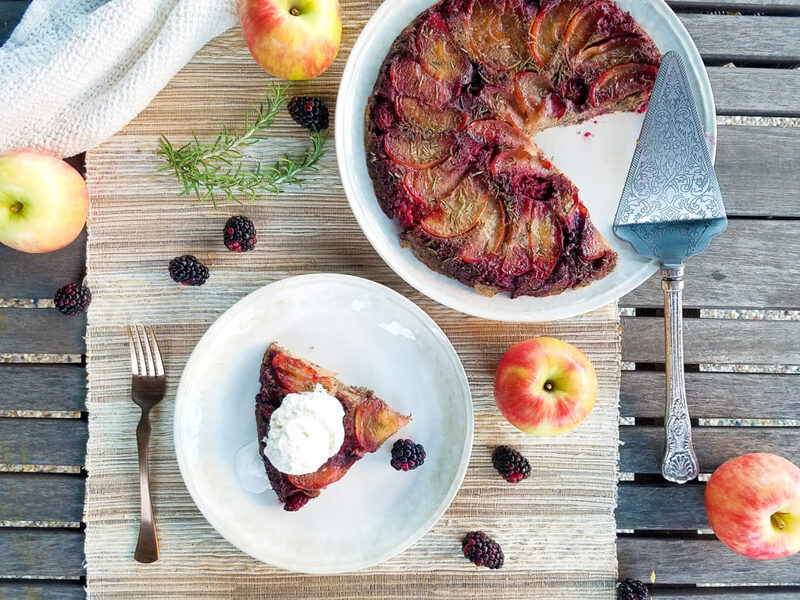 The result is a sweet and aromatic, fruit-filled twist on a breakfast classic which, with the addition of a scoop of ice cream, doubles as a delicious dessert. My idea of a perfect weekend morning is enjoying my coffee while leisurely scrolling through my news feed or flipping through the pages of a favorite magazine then enjoying a yummy, but easy to prepare, breakfast. The truth is, my weekend mornings are rarely this idyllic, but I have the perfect recipe for if and when they ever are. 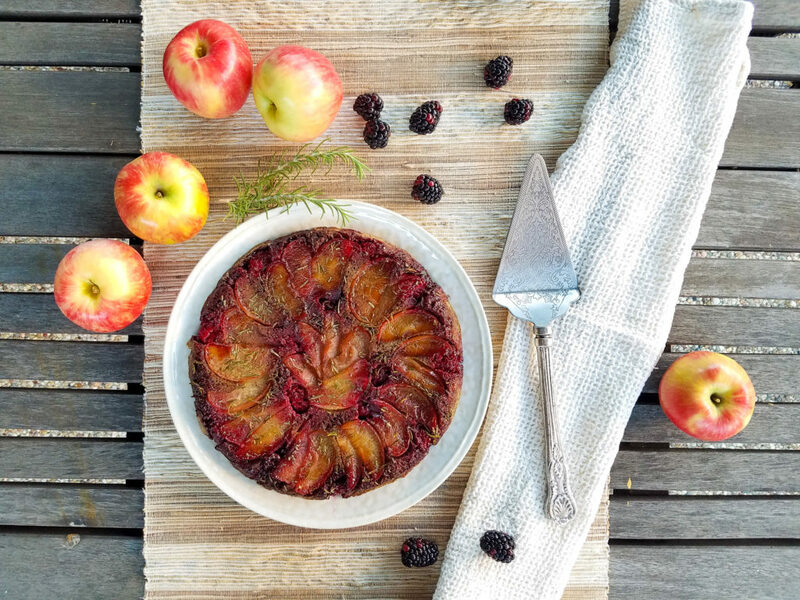 The beauty of this recipe is it’s relatively simple to prepare and once it’s in the oven you have almost a full 30 minutes to sit and relax while it bakes. That’s enough time for me to read two more interior design blogs and have a second cup of coffee, whoo-hoo! Years ago I went through a German pancake phase, you may also know them as oven puff pancakes or Dutch babies. 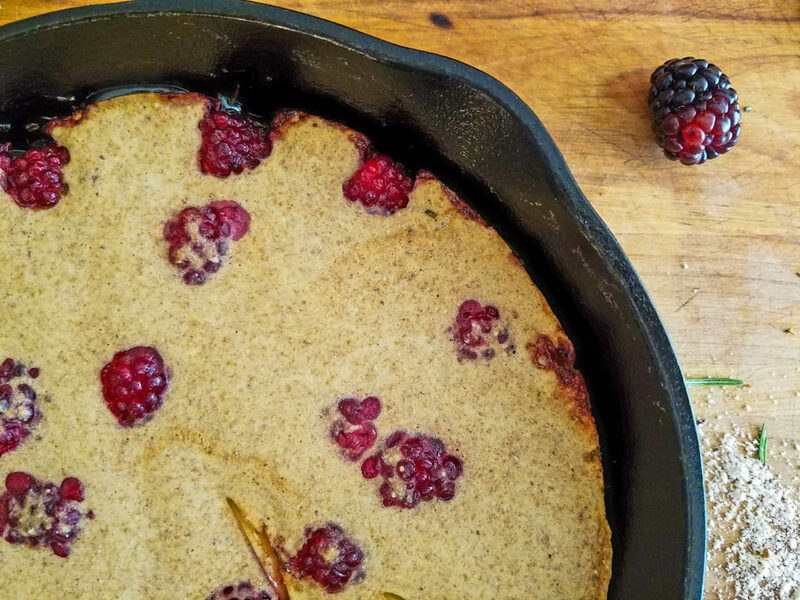 If you’ve never had one it’s a delightful little meal; basically a big egg-heavy pancake baked in a skillet until it puffs up into a fluffy golden cake. Hot from the oven, it’s delicious with a scattering of fresh berries and a dusting of powdered sugar. In the winter I make a cinnamon-apple compote to serve over it instead. 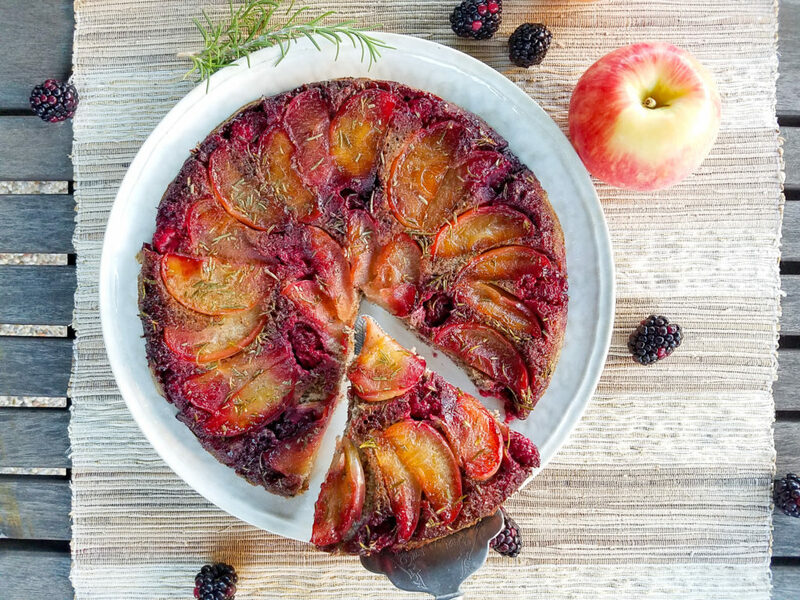 This recipe is more of a cross between a traditional pancake and a puffy German pancake, with the added twist of fruit on the bottom for an inverted presentation like an upside down cake. It uses less egg that the German variation and I’ve tried making it with both a combination of spelt and almond flours and buckwheat and almond flours. Both options make it more healthful and a bit denser than regular flour would. Coconut sugar, again a healthier option to the standard granulated sugar, increases the deep caramel flavor in the syrup. Raw or unrefined sugar would be alright if you don’t have, or don’t want to buy, coconut sugar but I love the extra caramel flavor coconut sugar brings to the dish. As I said, I’ve made it using both spelt and buckwheat flours along with the almond flour; the latter makes it gluten-free if that’s your preference. You may notice in some of the photos the batter has a different, darker more speckled look to it, that’d be the buckwheat flour. 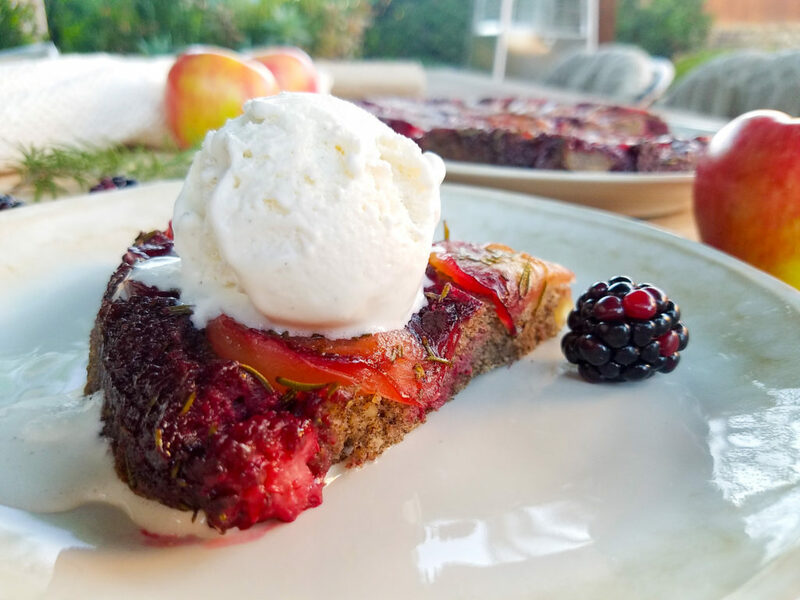 As a bonus, this recipe makes a beautiful dessert when served with whipped cream or a scoop of your favorite ice cream. Pure vanilla or salted caramel would be my preference here. If you choose to go this route and prefer the cake to be a tad sweeter simply increase the sugar in the batter, though personally, I don’t think it requires it. 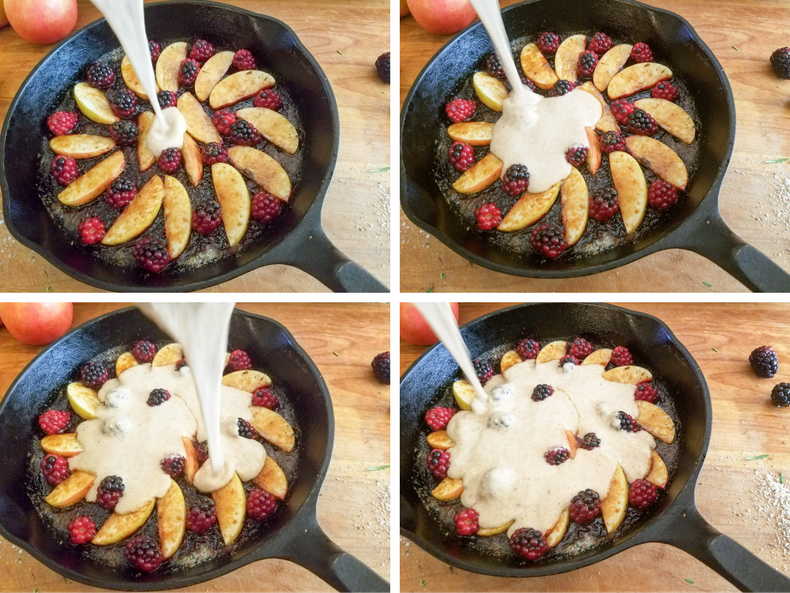 Note – If you choose, you can serve this straight out of the pan without inverting it but I like flipping it out onto a plate both to showcase the beautiful caramelized fruit and because it keeps the sweet buttery sauce on top where it can sink down into the pancake as you eat it. I used cashew milk but any kind, nut or dairy, will work. Preheat oven to 375. In a medium bowl stir together the flours, baking powder, salt and half (1 ½ tablespoons) the coconut sugar. In a separate bowl, beat the egg then whisk in the milk and vanilla extract. Mix the wet ingredients into the flour mixture and stir until just combined. Set aside. Melt the butter in a cast iron, or other oven proof skillet over medium high heat. 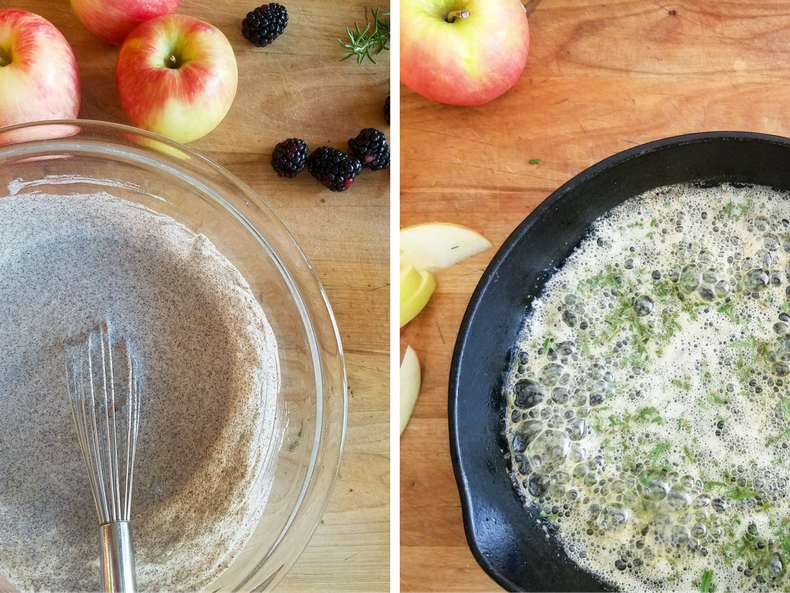 Once the butter begins to bubble, sprinkle in the rosemary and let it cook about 30 seconds then layer in the apple slices and blackberries. 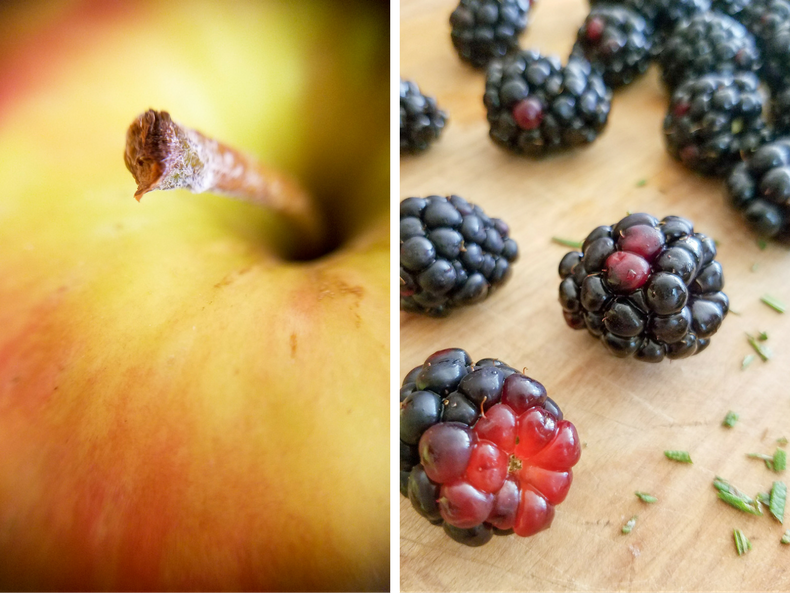 Sprinkle the remaining sugar over the apples and blackberries. With the butter gently bubbling, continue to cook about 3-4 mins. Pour the batter into the pan then shake the pan gently to evenly distribute the batter. Place the pan in the hot oven and cook about 25 minutes. Remove from the oven and let cool slightly. Holding a large serving plate over the pan with one hand, quickly but carefully flip the pan over so the cake inverts onto the plate. 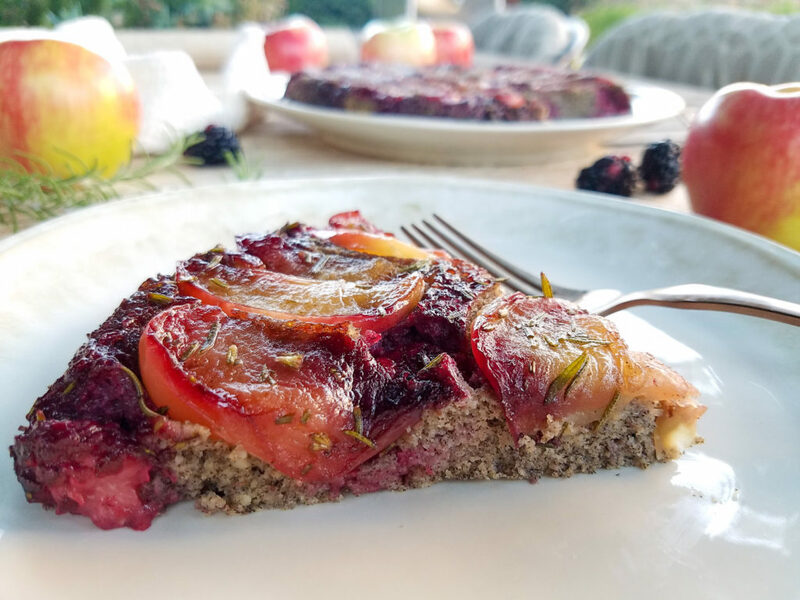 Slice and serve as is for breakfast or with a scoop of ice cream or whipped cream for dessert. Thanks Ina, I’d love to hear your thoughts if you make it! Amazing! It looks beautiful and it looks delicious! Which I am sure it it! Can’t wait to make this on a Saturday morning!